Looking for something different for your next event? 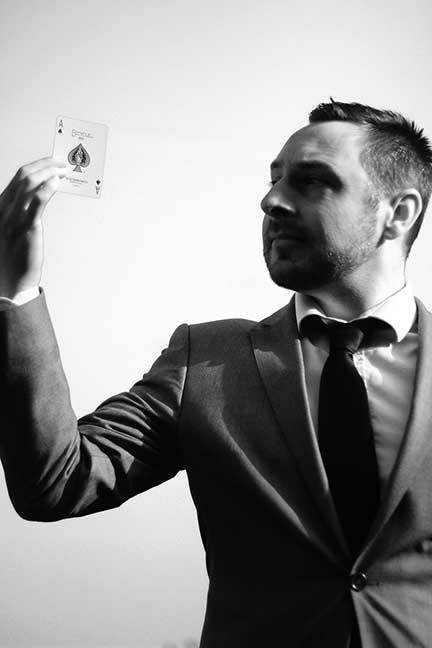 Mark Higgins is a magician and mentalist with over 25 years of experience. His close up magic and mind reading will provide you and your guests with an event to remember. I perform a brand of magic that is known as "Close-up" magic. Close-up magic is performed in an intimate setting, allowing me to interact directly with an audience. The magic actually happens in the audience's own hands and right under their noses! Along with traditional sleight of hand, I also mix psychology, hypnosis and mentalism into my performances. How did you become a magician? It all started when I received a Paul Daniels Magic Set as a child. This really sparked my imagination. I then got hold of every book and video on performing magic that I could and absorbed every scrap of information I could find. My love of close-up magic really solidified itself when I saw Wayne Dobson perform a torn and restored cigarette trick on TV. It was amazing to my young eyes. There was just Mr Dobson, a table and a cigarette. No fancy boxes or brightly coloured props. Just one man performing a miracle. It was at this moment that I knew what I wanted to do for the rest of my life. Travel and other costs will be considered in your quote. For more information, please drop me an email! Can you perform at my child's birthday party? My particular style is not suited to a younger audience. If this is something you require, I am able to recommend an alternative performer.